You can now buy a £50 turntable from Lidl | What Hi-Fi? 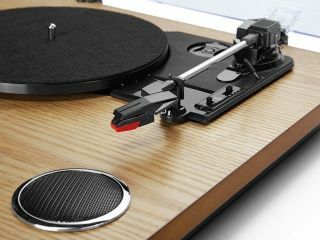 The Ion turntable has integrated speakers, a USB connection for digitising your vinyl, and can play records at 33, 45 and 78rpm. And it's £50. What's on your shopping list? Milk, bread, washing up liquid... record player? If you're a Lidl shopper, that last one can now be a reality, as the supermarket chain has started to stock an all-in-one ION record player. Just in time for Christmas. The deck is reminiscent of the infamous Crosley turntables, offering built-in speakers so you can plug 'n' play straight out of the box. There's also a USB output. The Lidl record player looks fairly similar to the ION Audio Max, which is currenly on sale on Amazon for £80. Earlier in the year we reported that Sainsbury's had become the biggest vinyl retailer on the high street, so it's perhaps no surprise to see Lidl getting in on the act. Though with record sales reportedly dropping in 2016, the store may be a little late to the party. But they're not alone - there's a £30 Aldi turntable on the way too. Then again, maybe this is the budget turntable people are waiting for in order to get them to actually listen to the records that they're buying - 48% of people who buy vinyl supposedly don't listen to their records. And if you're looking for some vinyl to get you started, then Black Friday might be a good place to start, not least as the people behind Record Store Day are getting in on the act. Not convinced? Allow us to point you towards our selection of the best budget turntables.